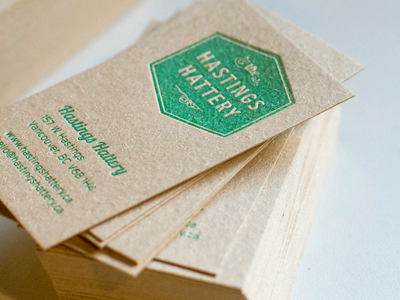 The Pulp Business Card collection is our most unique environmentally-friendly option available! Perfect for eco-conscious business owners, our Pulp Stock is made from 90% recycled content. You can see and feel the natural fibres of our Pulp stock which will give your design depth and character. This unique texture creates instant impression of sustainability and earthy appeal. Available in five unique colours and two different thicknesses, you are sure to find the perfect Pulp Business Card for you. Choose between 13pt and 20pt in Off-White, Vanilla, Cream, Beige, as well as our 20pt Grey Pulp. Choose Pulp for the most exclusive textured brochures. Your design will resonate with the natural appeal of this unique stock. You are guaranteed to stand out from the crowd with Pulp, available in a wide selection of sizes and fold options. Choose Pulp for the most exclusive textured brochures. Cream Pulp is light and warm in appearance, and available in 13pt, 20pt, or 2-ply 27pt thicknesses. Vanilla Pulp is slightly less bright than Cream, and has a more neutral tone. This shade is available in 13pt or 20pt thicknesses. Beige Pulp is a darker option and has a caramel brown colour. Available in 13pt or 20pt thicknesses. Off-White Pulp is the lightest and most versatile in terms of design. Available in 13pt or 20pt thicknesses. Grey Pulp is a medium dark shade and will have a strong affect printed colours (we recommend black and dark ink for best results). See: What colour are Pulp Cards? Please note that Red, Green and other shades of Pulp stock may be available to order. Request a Print Quote for custom options. Our Pulp range of stocks is unique from other types of paper in the texture - Pulp fibres are very visible and can be felt when handling the cards in person. This adds an earthy, raw and natural feel to the cards. They are also all made with 90% recycled content. If you have large areas of solid colour in your design – we would recommend ordering Letterpress output on the Pulp. Areas of solid colour can appear inconsistent when printed Digital output. Pulp is not suitable for bright colours and photographs due to the colour and texture of the stock. Large blocks of solid colour can appear uneven due to the texture in the stock when printed Digital output. If you have large areas of solid colour, a Letterpress Pulp card might be a solution. Fine detail does hold up well on the Pulp stock. We recommend a minimum of 1pt line thickness for fine detail on the Pulp stock. A bit darker than Cream, lighter than Beige - with a neutral hue. A soft yellow coloured stock with a warm hue. A caramel brown coloured stock lighter than Brown Kraft. Approximate values only. Please note the colour of the stock can vary. The whitest Pulp stock we have to a white is the Off-White. It is a refined premium looking stock, but is not bright white – with a tinge of yellow. All of our Pulp stocks are 90% recycled and printed with plant-based biomass inks. Pulp stock is uncoated and textured. It has a very raw and natural papery feel. Products created with this stock are suitable for most common uses and add-ons. Please note the thinner 13pt thickness options in Pulp will not be suitable for any kind of edge finish. We also offer a Letterhead stock in 100lb Cream Pulp that is suitable for use in your home / office printer. If you have any questions or concerns about what the product you are ordering is suitable for, please contact our Customer Service Line to discuss your needs and uses before ordering. Yes you can. Please place a Print Quote request for this service. Letterpress printing looks great on the Pulp stock. For further information on letterpress see: Letterpress Cards. To order Letterpress cards on Pulp stock, please place a Print Quote request. The texture of the stock will show through your design and affect how your design will appear. Due to this natural characteristic, the printed areas of the end product may appear inconsistent or slightly patchy. Although minimalistic designs are most suitable for this stock, the Pulp texture can create a nice, rustic, and artistic feel which is what some are going after. If this is not what you are looking for, or if your design has a lot of color and heavy coverage, we suggest a smooth, white and coated stock for optimal results. We recommend a safety margin of 0.25 inches away from the trim line for this product - that is 0.375" from the bleed. Due to the nature of the stock, it can shift significantly during printing and trimming processes. Shifts of 0.0625" to 0.125" can occur (which can cause your design appear off-center). We take all necessary precautions to avoid as much shifting as possible, however this risk is higher with this stock.